The 83701MCF000 Mark, Hrc can be ordered. Fits Honda. 83701-MCF-000 is the manufacturercode. This product is rated 4.7 stars! If the appearance of the VTR1000 this graphic fits is important, then renewing it, when the old one is damaged or just faded with years of U.V exposure, will keep that showroom fresh appearance that the old items tend to lose over time. And, of course, the graphics will have to be renewed if you are respraying or installing new bodywork. How important is the way your Firestorm looks - we would guess your answer would be; 'perfect'! Make sure you order all the parts required at the same time and save money by avoiding multiple shipping costs. here is how people rated the Mark, Hrc. 0 visitor(s) voted a customer review about the MARK,HRC to be helpful. Of the total 0 vote(s), there was/were 0 vote(s) recorded that did not find a customer review not be helpful. A really nice little decal. 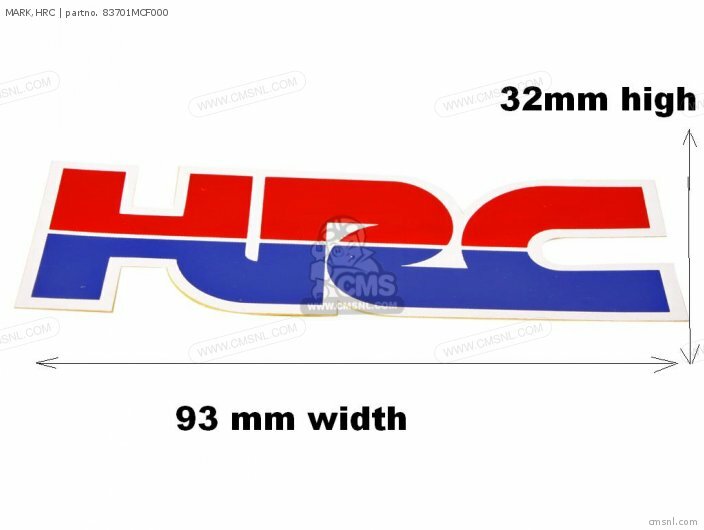 Add some flair to your bike with this HRC decal. If you want to discuss this MARK, HRC, please go the forum and post a message.